Another lovely dress. I also like the tarditional dresses on the two ladies. pas toujours élégante mais tous les goûts sont dans la nature???? A dress which is not only intended to please but also communicates is a sign of new life and dignity. I love this comment, i agree! I love Mette-Marit's outfit; I hope she will wear more like this. Wonderful Mette Marit. The ladies wearing the Bunad look awesome. No thick stockings or long prairie dress! She looks wonderful! I would like this dress for myself. 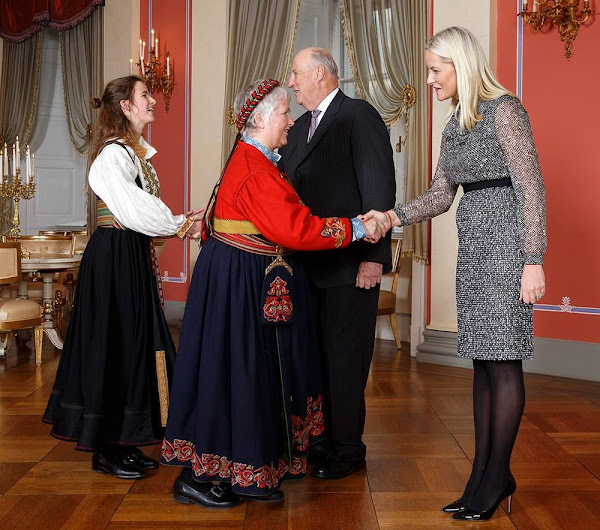 Mette-Marit wore something nice for once. I love the way this grey dress swimmers and the way the black belt defines her waist. She looks very nice!